Nurse Jackie: "F. The Lemurs"
The best episode of Nurse Jackie since this season started was a tribute to both the power of a good supporting cast and the idea that they might sometimes get to behave like something other than the lead character's enabler. Even Akalitus seemed awake, in touch, and not altogether thrilled about it, as if she had half a mind to grab a baseball bat and go all Kalinda on the writers who had turned her character into a pod person. It fell to her to deliver the news of the major story development: HR "has a bee in its bonnet" because "they are under the impression that someone in the emergency department is abusing narcotics," and until further notice, Jackie was being restricted from dispensing meds. In shock, Jackie tried to give Akalitus an out by saying, "So this is an HR decision?" Akalitus rudely swatted it away; she wanted it understood that this was her decision. "At a certain point, the discrepancies reflect on my ability to control my department." When Jackie, in cornered rat mode, tried to deflect suspicion onto other nurses, Akalitus swatted that away too. "This goes back a long way," she said, and all of a sudden, you had a sense of how much more attentive she might be to Jackie's transgressions than she's felt the need to let on, so long as Jackie's remained a valuable employee and nobody else picks up the scent. It was almost as if the woman runs a hospital or something. Angry and hurt, Jackie did the math, decided that two and two equaled five, and rushed to berate O'Hara for having sold her out. O'Hara wasn't having it, and Eve Best is never more awesome than when she isn't having something. "If I had any interest in having you pulled off the floor, I'd have done it ages ago," she said, in the voice of someone who's going to finish delivering King Lear's address to the storm on the heath better than anyone's ever done it before and then go have a good cry. "I don't talk about it, because I don't like talking about it. And I know full well that if I did start talking about it, you'd go so far underground that no one would hear your cry for help if in fact one day you'd need it. I've said nothing, and I've been asked." If Gregory House's friends would talk to him like that, maybe he wouldn't have to go parking his car in people's living rooms just to wake folks up a little when season finale time rolls around. Best does stellar work on the show whenever she's given half a chance, and here, given more than half a chance, she was spectacular. (Perhaps out of gratitude, she was also given a scene in which she got to mess with Cooper's head and steal a kiss from him, just for the hell of it.) So was Merritt Wever, who got to show some fresh emotional colors in a scene where Zoey seriously misjudged how much O'Hara, having just ordered Jackie to get the hell out of sight, was longing to hear the sound of her voice. The sight of Zoey taking refuge at the nurses' station while tearing up, wondering what she'd done wrong, and trying to decide whether it was okay to include herself in the long list of people for whom she felt sorry, was one of the great heart-tugger moments of the week. The other was Grace, in a parent-counselor conference, trying to explain in what sense she might be said to be suffering from depression. "I'm not sad," she said, as if terrified of causing her parents undue concern. "But I'm afraid I'm going to start pulling my hair out again, and I don't want to. I like my hair. I think it's pretty." There are probably people who will not melt at this, and the only way I'd know to deal with them would involve borrowing Akalitus's baseball bat. 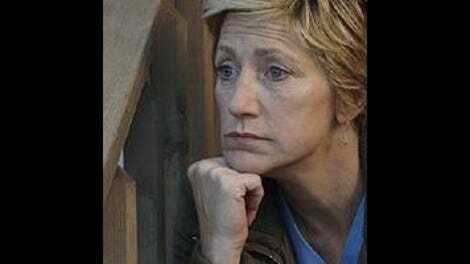 It's when the show is firing on all cylinders like this that you fully appreciate Edie Falco. She can hold the camera with the best of them, but she's generous with the spotlight and clearly enjoys playing with people who are stepping up their own game. Like the best series leads, she provides an excellent center of gravity. And in an episode like this one, where Jackie is on some level wrong with just about everything she says and does, yet seldom entirely unsympathetic, she gets to show what a genius she is at making hypocrisy understandable and even sort of likable. That's been an Edie Falco specialty since at least that episode of The Sopranos where Carmela spent just enough time in therapy herself to make it clear that she wanted credit for wanting absolution from her culpability in her husband's criminal lifestyle but didn't want it enough to cut up her credit cards, and she hasn't started phoning it in yet. Bumper sticker worthy: "Yeah, order me out of my own trauma!" T-shirt worthy: "Good-looking people have to stick together." "I hate the industrialized world. Also, I have a Kindle." "Ego is ego, my friend." "Is that Latin?" Cooper: "Why you do you feel bad for O'Hara? She's a doctor. With awesome shoes. And a town car. And an accent. Case closed!" Zoey: "Jackie's mad at her." Coop, without missing a beat: "I feel bad for O'Hara."